1 Who are RealJazzTracks for? o People learning to play jazz.. Some people use the Tracks as professional-sounding accompaniment on live gigs. o Sax, brass, strings, guitar players and singers usually want a full backing-trio with piano, bass & drums. These Tracks are on the 'Piano-Trio' pages. o Tracks for pianists and others wanting a piano-less backing are on the 'Bass & Drums Only' page. o Tracks with just Piano and Drums or Piano and Bass are on the Other Instrument Combinations page. 2 Isn't the iReal Book app for my iphone and iPad a cheaper alternative? iRB is a great app: it's very cheap; it has hundreds of songs; you can change the tempo, feel and number of choruses, and you can edit the charts. The question is how important the sound of your backing track is to you. The iRB built-in synth is basic, to put it politely. But even if you download iRB midi-files into a DAW and add better piano, bass and drum synths, the midi-patterns remain very simple, quantised and repetitive. They do not sound real. In sum, if you want a cheap, flexible play-along tool, iRB is for you. But if you want backing tracks - especially for live work – which sound like a real band, check out the tracks on this site. And remember you can have the track you want custom-made for the normal price. 4 How long is each Track? 10 to 12 minutes. A 10 minute Track gives you, for example: 10 choruses of a slow 16-bar ballad at 60bpm; 19 choruses of an uptempo 32-bar standard at 240bpm; 38 choruses of a 12-bar blues at 180bpm. Many people find the common 3 to 6 minute backing tracks annoyingly short. Over 10 minutes gives you plenty of time to get into it and try different things. 5 Does every chorus sound the same? No. The arrangements are ones I like to use, and I like a variety. So piano and bass patterns vary between laid-back and more assertive. Drums vary a lot - between brushes and ride, spare- to high-punctuation, ride-led to HH-led etc. And you'll hear the same phrase, bar or couple of bars re-appear occasionally - just as you do at a live gig. 6 What's in the Track download? The download is a zip-file containing the 10-minute MP3 backing track and a JPG file with a chart of the chord changes used by the musicians on the MP3. 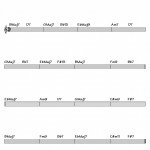 Click on the thumbnail for an example chord chart. o Burn several MP3 tracks to a CD to use with a cd-player. 8 What's the quality of the MP3s like? The instruments you hear are recordings of real players, mixed into a stereo WAV file, and then saved as a High-Quality MP3 at 160bps. MP3 files are much smaller and more convenient and it's virtually impossible to hear any difference from a WAV file. 9 Does the chord chart include the melody line? Afraid not. This raises copyright issues. Melody lines - the head - for standards are easily available from Jazz Real Books. Or - best of all - learn the version of the head from your favourite recording. o If the Real Book chord is G7, your chart might show G13, G9 or G11, to add more colour. If the G7 is moving to Cm, it might be G7#5 or G7alt. 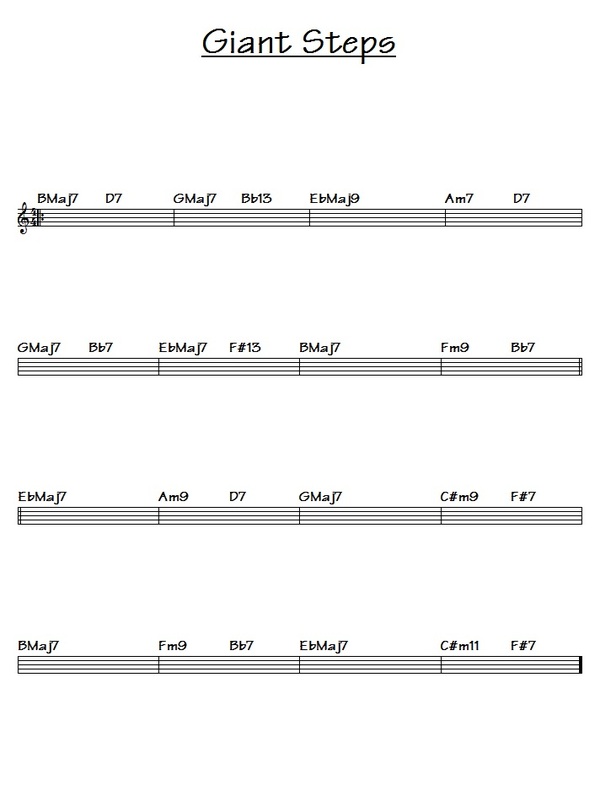 o If the Real Book has 4 bars of Dm, the chart may show: Dm-Em-Fmaj7-Em. Again, this is just to add colour, like a real pianist would do. 11 How do intros and outros work? o All Tracks start with a 2-bar count-in, played on the drumsticks: 1-3- 1234.
o Slow numbers (up to about 120bpm) are usually straight in after that. o Faster numbers have a 4 or 8 bar drum intro, after the stick-hits, to set up the groove. o Any drum intro is noted in the title of the Track (eg '4-in', '8-in'). o After all the choruses (10 - 12 minutes) the Track fades gently. 12 Why don't you offer compilations of Tracks ? Most people know what numbers they want, and resent buying a lot of tracks they don't really want just to get the one they really do. So it's better to offer tracks individually - and with the freedom to get (almost) any track you want, custom-made. 13 Why don't you pan instruments hard left or right in stereo, so that they can be silenced in the stereo mix? For three reasons. First, professional sound engineers normally keep the bass and drums centred in the mix. It sounds much better like that. Second, many people use headphones, and hard left/right panning makes the track painful to listen to. Third, the piano and drum-kit are stereo files, and if they're then panned hard left/right, you lose the natural-sounding stereo and it sounds peculiar. 14 Could I get the software and make my own backing tracks? Yes, certainly. There's plenty of fine software out there. Some say that DAW/sequencer production is driving out live recording. The quality of bass, drum and piano software and sampling has improved hugely in recent years. But there's a financial cost and a substantial learning curve for each bit of software. RealJazzTracks are for people who's priority is playing, and who want a quality jazz backing track quickly, without the expense of the core software and all the add-ons - or who don't have the time to learn how to use it. 15 What are the main bits of software you use to make the Tracks? PG Music is the start-point for the chord changes, often with their Real Track/Super Track musicians. Many drum tracks use XLN Audio's Addictive Drums, with a huge variety of midi versions of live jazz drum grooves. Some tracks have WAV drum loops. The piano is often Pianoteq's Steinway G4 Grand Piano or a Fender-Rhodes electric piano from Modartt. Mixing & mastering is continually evolving, using many different vst plug-ins in Reaper. 16 How much are the Tracks? o All Tracks on the Choose Line-up pages are £2.99, except drums-only (on the 'Other Instrument Combinations' page) which are £1.99, because they're easier to make. o There's a 33% discount on 6 or more Tracks. That's £12.02 for 6 Tracks, or £20.03 for 10.
o Custom-made tracks for standards which other people may want are normal price: £2.99. For specially-made non-standard tracks, we'll agree a mutually acceptable price. Click on the Custom-Made Tracks Tab to find out more. 17 Why are all Tracks the same price? For simplicity. There are so many steps and variables in making the Tracks and putting them up on the RJT site, it's just not worth trying to set variable prices. Drums-only tracks are £1.99, because there's no piano or bass programming involved. 18 Is PayPal the only way to pay? o At the moment, yes. If you're not registered with PayPal, have you got a friend who could buy it for you ? o If you don't have a PayPal account, they may offer you the option to pay with a credit card. This method works, but note there's a long delay - about a week - before the payment clears and the Track is sent to you. o If you're completely stuck, get in contact and we'll think of something. 19 How do I get the Tracks and chord charts onto my computer? o When you click Buy on a Track, it's added to your purchase list on the Checkout Tab. o Click Purchase and complete the PayPal process. o Then check your email and you'll find a Purchase Receipt with the download-links for your Tracks. o Click the download-links and save the Track zip folders to your hard-drive. o Unzip (extract) the zip folders and your Tracks and their JPG chord charts are ready to use. 20 Why are there several versions of some songs? The Tracks have different tempos, feels (swing or even) or arrangements (different pianos, drum patterns etc). Listen to the samples to hear the differences.